When was the last time, you filled out an online form? Online forms are a component of many company websites and have many other business uses. For example, Fit Small Business uses online forms when hiring staff. We require prospective candidates to fill out several questions when submitting their resume. JotForm is one the largest and oldest companies specializing in providing businesses with highly customizable online forms. They are known for having over 500 pre-made designs (themes) to use when creating a form. Started in 2006 by Aytekin Tank, JotForm has been used to create more than 6 million forms by 2 million users. They have a free offering which can be used to collect up to 100 responses per month. For $19 per month, you can accept up to 1,000 form submissions. I had a chance to interview, Aytekin Tank, the founder and CEO of JotForm. The following Q & A are based on my notes from the interview and are not an exact transcription of our conversation. What are the primary uses of online forms? The number one use is for the contact page for small business websites. Also, forms are commonly used to schedule appointments, book orders, and do customer satisfaction surveys. 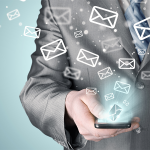 Recently, we have been seeing an increase in using forms to accept orders and take payments. JotForms integrates with Paypal and we process $10 million in payments for goods and services every month. What can increase the probability of a person filling out a form? 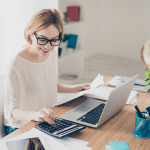 According to our research, there are two easy ways a business can increase the completion rate of the form: 1) include instruction and 2) have relevant images. Forms that included instructions at the beginning of the form or before questions were asked were much more likely to be completed. In the data we analyzed, forms without instructions were completed 14% of the time. The number increases to 22% for forms with instructions. The increase is completion rates is even more dramatic when comparing forms which included image versus those that did not. Forms that included images had a completion rate of 27% versus 15% for those without images. Does the number of questions matter? It depends on the importance of the form to the user. If the user has only a casual interest in communication with the company, then we start seeing a dramatic fall-off in completion rate for forms that have more than 4 questions. Does the design of the form impact the completion rate? While I believe the design of a website and the forms within a website impact visitors impression of a company, we have not seen it have a major impact on the completion rates. You are an entrepreneur and small business owner. Any general advice for our readers? Enjoy the journey. Starting a business is a marathon and not a sprint. If you don’t enjoy the journey, ie. the day to day operations and problems, you will not be able to sustain the effort needed to be successful. 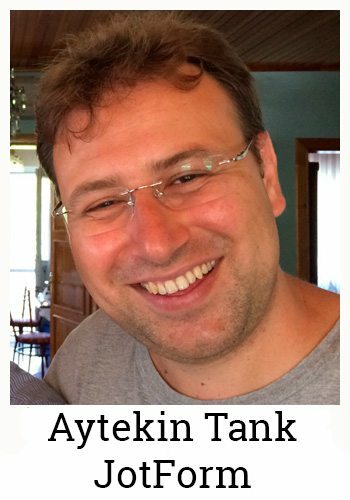 While working as a developer for a media company in New York In 2006, Aytekin Tank saw a problem. Creating online forms was burdensome. Building them required technical expertise and loads of time, and there weren’t any tools out there to make them any easier. To provide a solution to this problem, he built JotForm, which is bootstrapped and has been growing for almost 10 years. Building great products drives Aytekin, and his vision for JotForm is not stopping anytime soon: making form building so easy that anyone can create forms as a part of daily or work life without thinking about it. Born in Istanbul, Aytekin graduated from the University of Bridgeport in Connecticut with a degree in computer science. 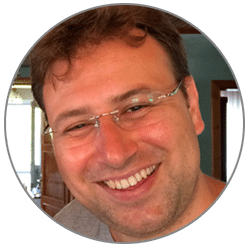 Outside of working on the continual betterment of JotForm, Aytekin loves travel, skiing, and spending time with his wife and son.